It all started during recess one day at A. Russell Knight Elementary School last school year. Jenna McGovern, Maddie Winslow and Talia Dugan, then in the fourth grade, were talking as they played three square when they came up with an idea. The following fall, the idea came to fruition. McGovern, Winslow and Dugan got the help of some of their friends to hold a food drive at their school, with all of the donations going to the Cherry Hill Food Pantry. Having a fundraiser take place is nothing new for Knight Elementary. Service is a big part of the school culture, and the school itself has held numerous fundraisers in recent years. This food drive unique was unique because it was entirely student organized. Last school year, the girls were unable to move forward with the food drive because there were other fundraisers, such as Volley for Support, already taking place. However, Principal Eugene Park said the students were persistent. McGovern, Winslow and Dugan were able to get several other students to help them. 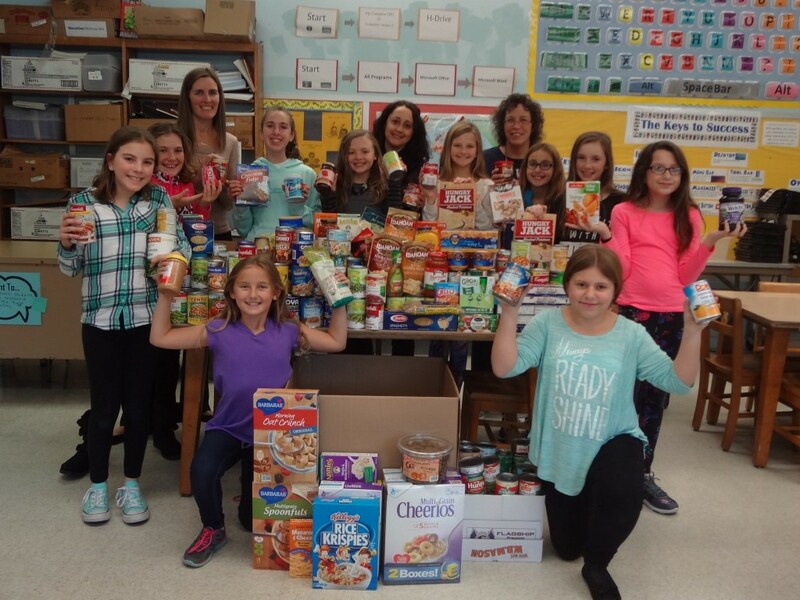 Fifth graders Bella Stearne, Kelly Topham, Emma Chorzelewski, Elena Coverdale and Isabel Coverdale and third grader Abigail Callahan joined the food drive team. The girls worked to get the word out about the food drive so students, staff and members of the school community could donate. A few teachers also helped the girls with the food drive. The students used their recess time for four weeks to make posters and flyers as well as go through the day’s donations. “It was a good idea to use our recess time, where we could be doing anything we wanted, to help out with the people that need it,” Fiona said. Once the drive wrapped up prior to Thanksgiving, the students had collected 484 items, which the Cherry Hill Police Department picked up prior to the holiday to deliver them to the Cherry Hill Food Pantry. “We made sure everything was delivered before Thanksgiving so they could have a nice dinner,” Maddie said. The girls’ efforts have been noticed in the community. On Dec. 12, Mayor Chuck Cahn was to present a proclamation to the students during Township Council’s meeting in recognition of their hard work. The girls said they didn’t expect recognition from the drive. There were no prizes or giveaways for students who donated, and the girls didn’t perform the drive for community service hours. They held the fundraiser just to serve the community. “When we were doing the food drive, we were learning how to help each other and how to put our mind to something,” Talia said. The girls said this won’t be the last time they hold a food drive. All the fifth-grade students said they plan to hold another drive when they move to middle school, and Abigail said she plans to lead another drive at Knight when she moves to fourth grade next year.